On November 10, 2015 Britain’s Prime Minister David Cameron held a keynote speech at the Chatham House, launching his proposals for the reform of the European Union - a preliminary step and condition to the referendum on Britain’s stay in the Union, which will be held by 2017. Cameron’s renegotiation proposal revolves around four political issues - corresponding to the main points of his Chatham House speech: granting equal power to Eurozone and non-Eurozone member states in EU decision-making processes; reversing the objective of an ‘ever closer Union’, written in the treaties; making the European single market more competitive; finally, easing off intra-EU migration flows. Using natural language processing (NLP) techniques, we have analysed reactions to Cameron’s speech on the micro-blogging platform Twitter. We have focused, in particular, on the issue of intra-EU migration - Cameron’s fourth point - which is arguably the most politically sensitive and prominent in the current Brexit debate. Our objective was to see, first, if Cameron’s stance on the migration issue triggered a reaction and discussion on Twitter, and second whether such discussion was structured along clear lines of conflict. Through Twitter’s ‘search’ and ‘stream’ APIs we downloaded tweets matching a set of keywords at different levels of precision,[i] starting on November 10 and for the two days following Cameron’s speech. We then analysed this corpus of tweets by means of a semi-automated approach relying on NLP, and based on the construction of classifiers to detect, at each successive stage of the research, language and meaning patterns in the examined tweets. Figure 1 shows our classiﬁcation pipeline. 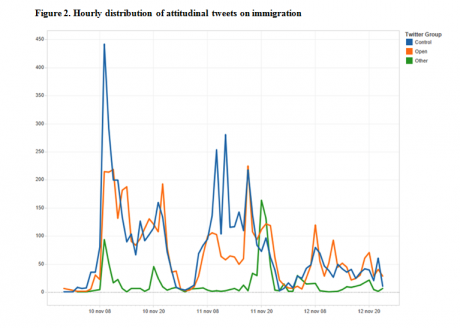 Broadly, we built and trained classifiers to sort tweets on the basis of: 1) their relevance vis-à-vis Cameron’s speech, 2) the presence of an attitude towards the immigration issue, and 3) the sentiment being expressed. The performance of our classifiers is detailed in table 1 (click pictures to enlarge). The classification procedure left us with 8,568 tweets expressing an opinion on the intra-EU migration issue. Overall, such tweets show a negative reaction to Cameron’s stance on the matter. Looking more closely, we were able to separate groups expressing different types of criticism: 3,982 (46.5%) tweets attack Cameron while defending the principle of open borders in the EU, whereas 4,077 (47.5%) oppose the PM by arguing for a closed borders scenario. This balanced picture chimes with results of a recent study by ICM, showing that Britons are evenly split on the topic of the EU referendum. Figure 2 shows the hourly distribution of tweets containing a given attitude. The closed borders discourse (blue line) displays three hikes (where it surpasses the open borders one—orange line): the first in the morning hours of the November 10—exactly when Cameron was presenting his demands at the Chatham House—and two more on the next day. The two November 11 hikes were mostly due to an intense retweet activity around two specific tweets by Nigel Farage (the UKIP leader accused Camreon of ‘fiddl[ing] with migrant benefits’, whilst ‘EU migration surges to record high’, and suggested to ‘leave the EU to control borders’) and the sharing of a Telegraph article by William Hague, in which the former foreign secretary defined the migration crisis as a ‘gust of the hurricane that will soon engulf Europe’. On November 12, conversely, the open borders supporters were louder. This increase in activity was mostly due to the Official statistics watchdog’s confuting of the figures used by the PM during his speech. The Independent, in particular, covered the news in two separate stories. This case, together with that of Hague’s article, exemplifies the important role played by news releases in animating Twitter discussions. Table 2 shows the most shared media contents for both groups over the three days of collection. The most shared tweet in the open border group reminded people that ‘EU migrants pay more than they take out in benefits’, whereas the second most shared news story by the closed-borders group focuses on the absolute numbers of newcomers to the UK from Romania and Bulgaria. 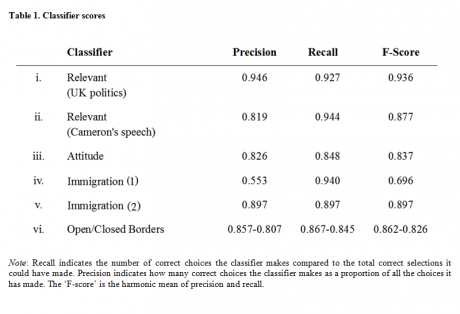 Figures 3 and 4 highlight the two discourses’ semantic core, which we obtained by selecting the 50 most shared tweets of, respectively, the closed and open borders groups, and removing from each corpus a set of common words, such as ‘david’, ‘Cameron’, ‘EU’, ‘migration’, and so on. 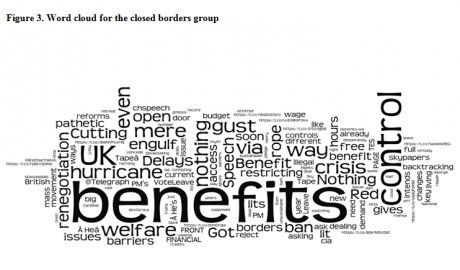 Both word clouds show the centrality of the welfare benefit theme in the broader discussion on intra-EU migration flows. They also show, however, some distinctive traits. 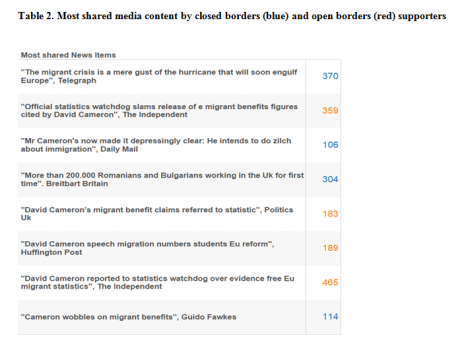 The importance of news sharing appears quite clearly in the closed borders group, which tweeted words such as ‘hurricane’, ‘gust’ ‘mere’ and ‘engulf’, directly derived from the Telegraph story. 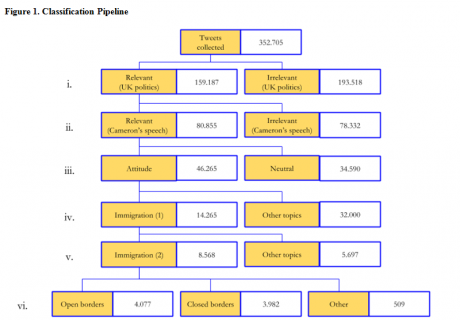 On the open borders side, it was words such as ‘statistics’, ‘stats’, ‘watchdog’ and ‘figures’ - echoing the clash between statistic authorities and Cameron - that appeared more frequently. Our analysis provides interesting information about the nature of Twitter and its reaction to Cameron’s proposals. In the first place, it is clear that Cameron’s speech triggered an attitudinal discussion on Twitter. Approximately 40 thousand tweets (roughly half of the tweets relevant to Cameron’s speech) can be interpreted as containing an attitude of some sort. Of these, more than a fifth, as shown, focused on the intra-EU migration issue. The reaction we observed was mainly directed to Cameron’s reform proposals. In particular, we noted an overwhelming presence of negative attitude with respect to what was presented by the PM: this result seems consistent with evidence from opinion polls indicating little confidence in Cameron’s ability to strike a good deal out of the renegotiation process. It is also interesting to see how the ‘offline’ event - Cameron’s Chatham House speech - functioned as a trigger for a much wider discussion on the general principle of free movement inside the European Union, in particular with reference to the welfare benefit debate. In this sense, Twitter appears as a ‘battleground’ for users holding different political views. In such a battleground, active and engaged profiles tend to operate as amplifiers of political leaders’ messages and news items. [i] Extracting Twitter data on a specific topic means facing a trade-off between ‘precision’ and ‘recall’ (i.e. comprehensiveness): a very precise collection strategy will likely result in tweets that are mostly on topic, but will also miss important conversations. The opposite is the case for more inclusive collection strategies. We opted for a balanced set of keywords and hashtags, containing very specific terms (e.g. #euref, #cameronletter) as well as generic ones, like ‘Cameron’. This article is published as part of an openDemocracy editorial partnership with EuVisions, an online observatory on social Europe established within the ERC-funded REScEU project, based at the University of Milan and the Centro Einaudi of Turin.